A sales-type lease exists when (a) the lease does not meet the criteria to be classified as operating and (b) the lessor realizes both interest income and a profit (or loss) on the transaction. Therefore, the fair market value of the leased asset is more than the lessor’s cost to purchase the asset. Consider an example of how to account for this type of lease: Green Manufacturing leases a computer system to ABC Corp.
Green pays $120,000 to buy the computer system and leases it to ABC for $150,000 on January 1, 2012. Green reckons that the computer equipment will have a residual value of $10,000. The lessee doesn’t guarantee this residual value. The term of the lease is six years. Rounding out the picture, Green wants a rate of return of 11 percent, and the first lease payment is due on January 1, 2012. Find the present value of the residual value, which is $5,346 ($10,000 x .5346). Go to the present value of 1 table at 11 percent for six periods — the factor is .5346. Calculate annual rent, which is $30,804. Because ABC makes the payment at the beginning of each period, use the present value of an annuity of 1 due table. At the intersection of 11 percent and six periods, you see that the factor is 4.6959. To get the annual rent, you have to subtract the present value of the residual value from the total lease amount ($150,000 – $5,346 = $144,654). Then divide $144,654 by the annuity factor of 4.6959. Figure the $114,654 cost of goods sold amount by subtracting the present residual value from the price Green pays for the equipment ($120,000 – $5,346 = $114,654). 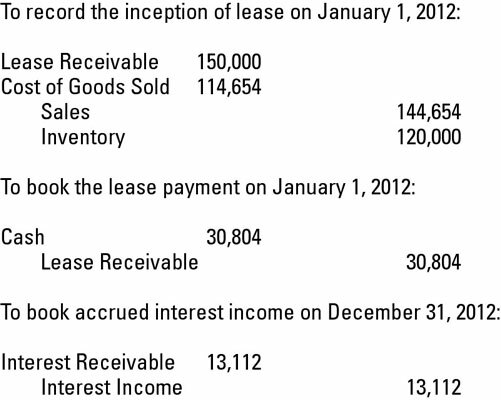 Interest receivable at December 31, 2012, is $13,112 ([$150,000 – the January 1, 2012, payment of $30,804 = 119,196] x .11). Here’s how the journal entries play out for the first year of this sales-type lease.